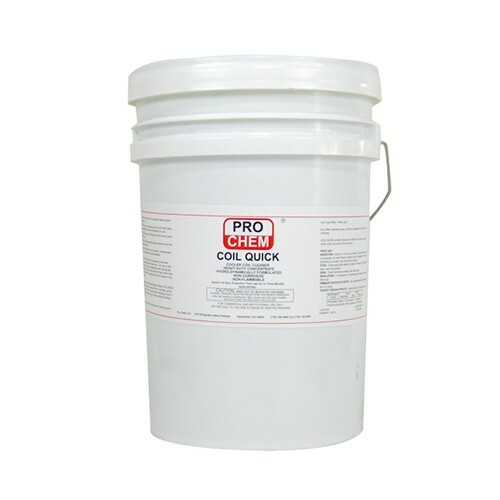 Coil Quick | Pro Chem, Inc. COIL QUICK is a heavy-duty, noncorrosive concentrate air conditioner coil and filter cleaner. Prevents dust, dirt and other types of bacteria-bearing soil from accumulating on coils for up to 3 months. 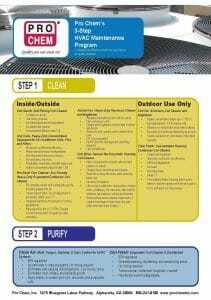 Condensation enables the hydro-dynamic COIL QUICK to keep air conditioning coils clean and odor free. Its sustained cleaning action provides 24 hours protection, which improves efficiency, saves electrical costs, and in the process preserves the life of coils. COIL QUICK is intended for use as a compound for treating boilers, steam lines, and/or cooling systems where neither the treated water nor the steam produced may contact edible products in areas of official establishments operating under the Federal meat, poultry, shell egg grading and egg products inspection programs where there is no possibility of food contact in food processing and food handling establishments. Dilute one part COIL QUICK concentrate to three parts water. Spray directly onto fins and coils. Turn unit on and normal cycling will create condensation, which will activate concentrate and keep coils clean and odor free continuously.